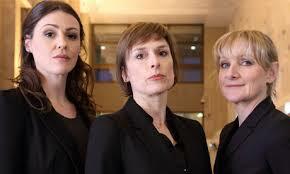 Scott and Bailey is a show following two detectives in the Major Incident Team that investigate big crimes – mostly murders, but other nasty stuff, too. Janet Scott (Lesley Sharp) is a family woman having issues at home and Rachel Bailey (Sranne Jones) is single after (in the first episode of the first season) being dumped by her boyfriend who turns out to be married with a family. The show so far has had three seasons and I hope there will be more. It’s great to see strong female characters who speak their mind. I’m not totally sure how realistic it is having just so many women in high roles in the police in the UK, but it’s nice that it is depicted as happening with no hoo-har. Plus, two of the most senior females are played by two fabulous British comic talents, Amelia Bullmore and Pippa Haywood, and there is just a hint of comedy coming through their roles in this show.